Winter Concert Photos and Videos! Our annual Winter Concert brought music and holiday merriment to our halls right before Winter Break! Students in Grades 1-10 showcased their musical talents in choir and instrumental performances led by our great music faculty consisting of Dr. Inman, Mr. Ingels, Ms. Taylor and Ms. Sherman. Dr. Inman loves guiding young singers to their “voice," and she found it incredible and inspiring to see the many talents of our students on display. "It’s confirming that what we do as a fine arts faculty is so important to the overall education of the students," said Dr. Inman. "It’s also a chance for us to see our students outside of our classrooms and interact with other teachers and community members." Students in Grades 1-4 sang their hearts out and performed on a combination of percussion and string instruments. A huge thanks to Ms. Taylor for leading some of our youngest students in holiday songs, drum circles and wonderful expressions of our diverse community. This year marks Ms. Taylor's first year teaching at BASIS Independent Brooklyn after receiving her Master of Arts degree in Music Education from Teachers College, Columbia University. As a shy and quiet child, music always challenged Ms. Taylor to step out of her comfort zone and into new and exciting experiences. Music encouraged her to be confident in leading, responsive in collaborating with peers and passionate about performing and composing music. Her goal as a BASIS Independent educator is to create new and exciting learning experiences for her students that will help foster these self-discoveries and growth in her own students. 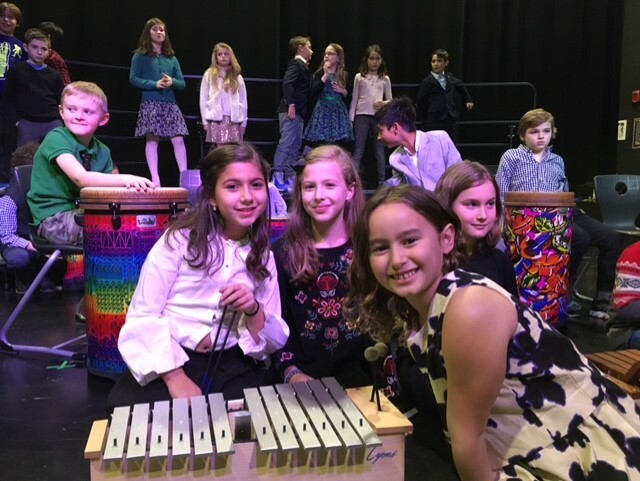 Our older students demonstrated their talents in choir as well as on musical instruments ranging from saxaphone and electric guitar to drums and piano. Dr. Inman led the class choirs and Mr. Ingels led our new symphonic orchestras and band. 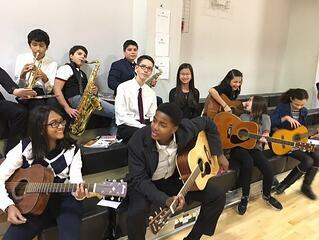 Ms. Sherman led our new student guitarists showcasing their talents. Grade 5 Choir "Carol of the Bells"
Mr. Ingels joined our school this year and currently serves as the band, orchestra, and guitar teacher. He strives to engage his students in harmonious and exciting music making. One of his goals this year is to invite students to explore why music is so powerful, and how we can express our emotions through different elements of song. Thank you so much to all the families who came out to cheer on our students! It was a wonderful celebration of creativity topped with holiday spirit! Join us at our upcoming Information Sessions in Brooklyn to see for yourself what all the buzz is about! Romeo & Juliet Site-Specific Performance - Plus Video Clips!